From now on officials’ team is complete! Meet the brightest addition to the session, the team of cherry-on-top, the Media Team! These imaginative, creative, and talented individuals are the ones who will provide the session with positive vibes and keep us hyped. They will be there to grip every moment of your session memories and convert them to a real masterpiece. The Media Team is led by Dimities Davris, who, for indeed, made a rational decision in selecting his Editorial Assistant and Journalists. Let’s wish them a productive output and may their liveliness be ever along with us! Get ready and start to count down the days! Tbilisi 2017 is about to start! This entry was posted in News, Tbilisi 2017 and tagged #ISTbilisi2017 on November 3, 2017 by Gega Darakhvelidze. Look at these faces and observe them carefully, as you might not encounter such bright, hard-working, and dedicated individuals all together at one place, at one session! We feel confident of saying that without these people and their effort, Tbilisi 2017 would not promise to be this neat and sophisticated, as it is planned to be. Meet the pillar of the strength, spirit of whispering woods, Philosopher’s magic stone, and the secret recipe of a great session- The Organising Team! The Group you see has been forming since last year and is complete now! Tamta and Zurab, for indeed, made great choices and brought the most unique faces to the team, which likewise is as diverse as their personal experiences and nationalities. They guarantee that the quality of the 86th International Session will be remembered for a long time, opening new chapter of EYP for the future events. 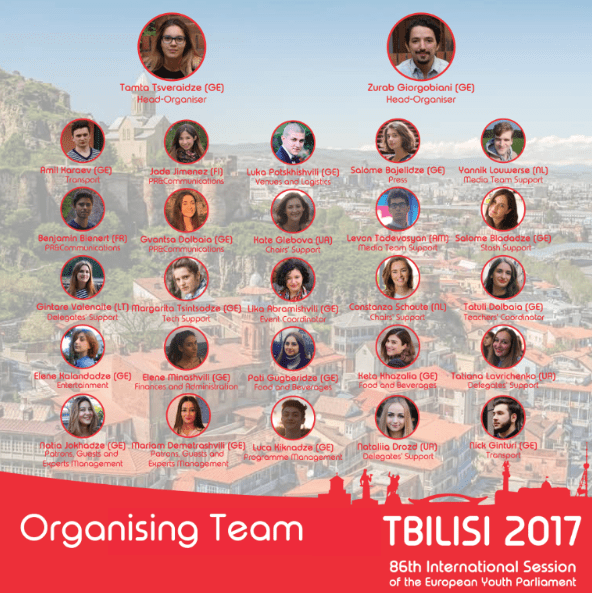 We assure that all of these faces have something new to offer, something that can be revolutionary at Tbilisi 2017. So, stay tuned and wait for more, as we are aware of your impatience for November! This entry was posted in News, Tbilisi 2017 and tagged #ISTbilisi2017 on September 27, 2017 by Gega Darakhvelidze. Our Head- Organisers, Tamta Tsveraidze and Zura Giorgobiani are currently attending an event in Berlin, Germany, where they met up with the whole team of Chairpersons and representatives from the International Office of EYP.With all the academic staff getting ready for the session, let’s look at how it all started. 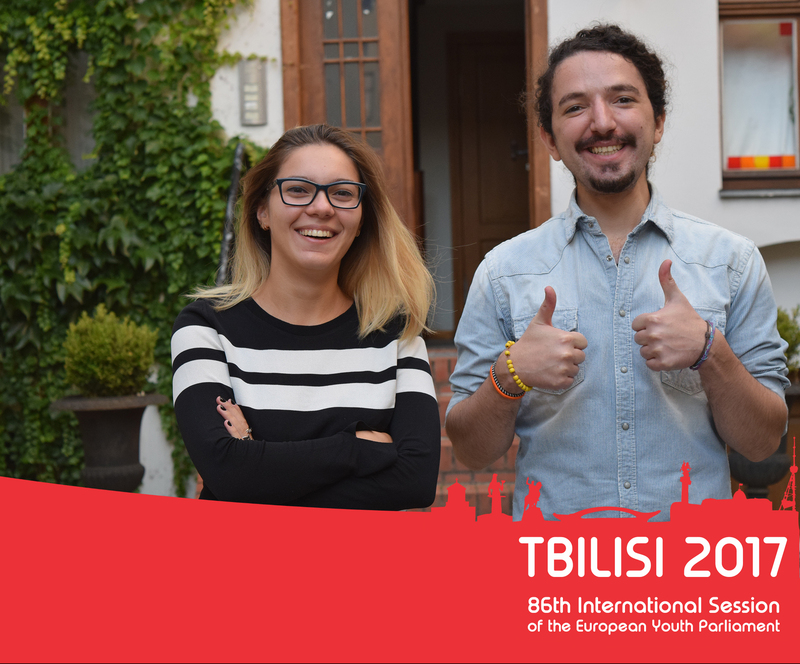 Our beloved head organiser, Tamta, shares the story of how Tbilisi International Session embarked on and got sophisticated time by time.“It just happened that Zurab and I were both elected as the Board Members of EYP Georgia for the term of 2015-2016. It was a year of the firm beginning of the BASES and we had to pop in quickly as there were four projectw that we had to organise within less than five months. By pure coincidence, we were already selected as the Head-Organisers of two different projects of relevant range – 9th National Selection Conference and 6th International Forum in Tbilisi. After that, the journey began! It was right after we were finished with the whole post-project process, when we felt brave enough to dare and apply for hosting the 86th International Session of the network – in only four years from hosting the event for the first time. It was a great challenge both for Georgia, as the developing country of the East, and the National Committee itself. However, we got in touch with our partners, consulted with the Project Coordinator – Stefan Vandenhende – and put together a plan that became a tie between the two International Sessions. This link is exactly where the decision about the Session Logo came from. By hosting yet another flagship event, not only we wanted to challenge ourselves but show the rest of the network that a tiny post-soviet country of Georgia ( not Atlanta, Georgia, for sure) can develop from year to year and have an actual impact on the network. The round date of 30 is yet another reason for celebration. By hosting 86th International Session we, simultaneously, celebrate the success of the organisation, which brought a lot of new to our lives, and we would like to share it with the rest of Europe. #Throwback to when we received the call from the meeting of the Governing Body of the organization. We clearly remember the following words “If you have no plans for November 2017, you now have to Head-Organise the 86th International Session”. And that was not the minute we realised what we had put ourselves into; in contrast, the consciousness is yet to come, probably somewhere by the end of November, the time we will face that another chapter of EYP has just been closed in our lives. This entry was posted in EYP30, Tbilisi 2017 on September 23, 2017 by Gega Darakhvelidze. 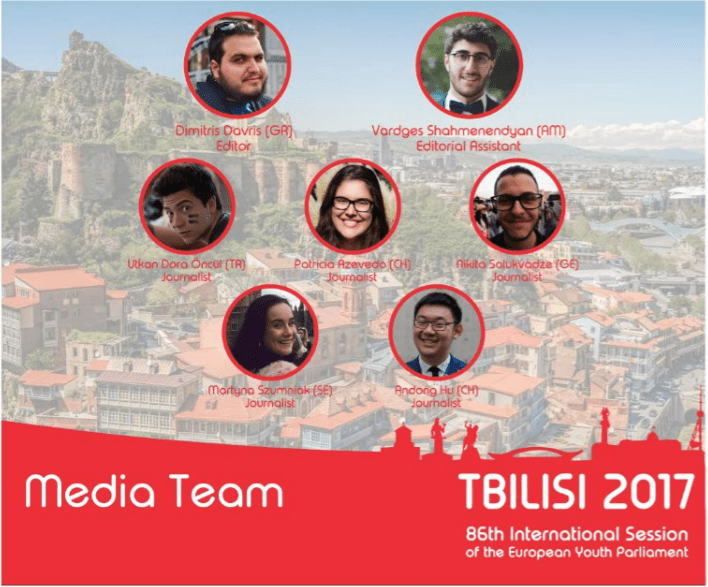 Afer disclosing the Chairs’ team to you, it is time to announce the Editor of Tbilisi 2017. 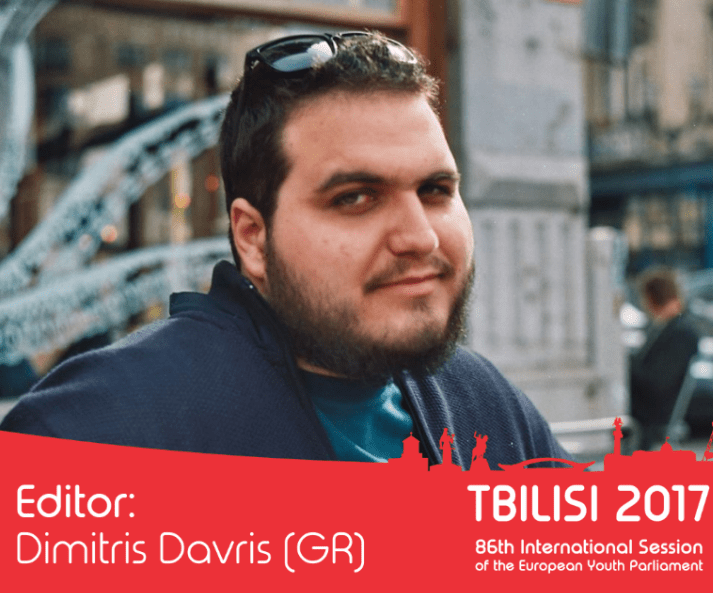 Meet Mr. Dimitris Davris, the person with life-time experience, as the leader of the Media Team! We are excited to see what Dimitris has to offer to the session, and we are sure that the output of his team will be groundbreaking! As the Deadline for the Editorial Assistants and Journalists is 25th of September, you still have time to apply! You have made the first step in making the 86th International Session of the European Youth Parliament a session to be remembered for the years to come, and for that, I congratulate you. The Media Team can have a vast impact on the overall experience of the participants, create memories and conceptualise moments. But is it just that, or is there something beyond? What we are looking for is individuals with diversified set of skills and characteristics, a mix of backgrounds and experiences; individuals that will have the freedom to carry out projects, have a space for personal growth and development, but first and foremost, bring their own perspective into the session. Once again, do not hesitate to apply! You might be the lucky one to join the team, which is a precursor of productivity, efficiency and fun, with Dimitris heading it! This entry was posted in News, Tbilisi 2017 on September 22, 2017 by Gega Darakhvelidze. We are thrilled to inform you that the President of Tbilisi 2017, Valentina Mina, will be accompanied by her chosen ones! These bright faces you see on the picture are the Chairpersons who have an immense source of creativity and experience to share! Their passion for the EYP is, truly, exemplary and might be contagious to others! Putting their astonishing minds together, you will believe in miracles, as the team of such intelligent, dedicated, and diverse individuals guarantee that the academic part of the session is in safe hands. We believe that their motivation and dedication will colour the session environment with the warmest and brightest tints. Cheers to the complete Chair’s Team and do not forget that the deadline for the Media Team Members is 25th of September! This entry was posted in News, Tbilisi 2017 and tagged #Chairs on September 21, 2017 by Gega Darakhvelidze. As we have already closed the call for the Chairs’ team, it is time to gather the most vibrant participants of the session- The Members of the Media Team! Editor(s), Editorial Assistants, and Journalists- it is your turn to impress us! If you can do magic with your camera and beguile everyone with your creativity and motivation, this chance is for you! 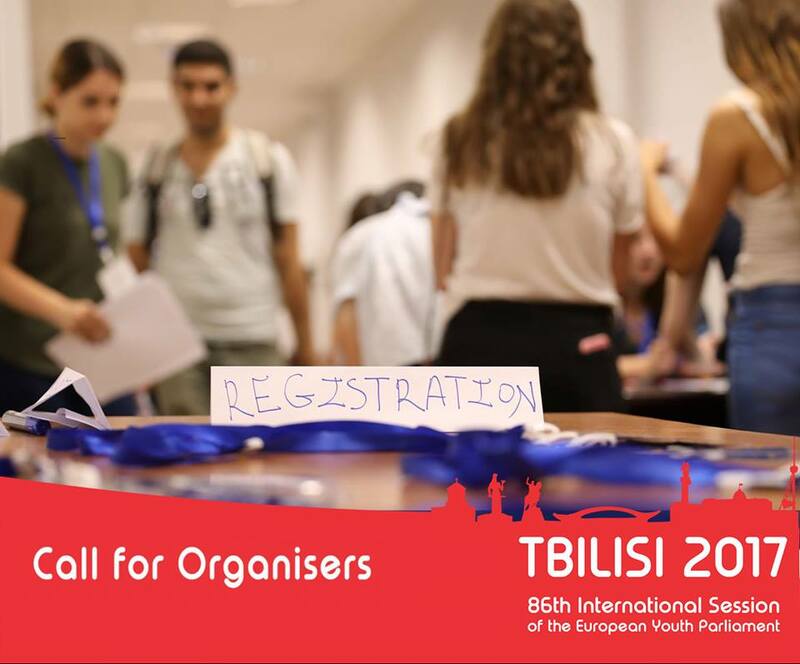 Join Tamta and Zurab, the Head Organisers and Valentina Mina, the President of 86th International Session of EYP, and embellish the team of officials with your power! The Call is open for the Editors until 18th of September. Once they are selected, they will select their Editorial Assistants and Journalists, for whom the application period ends on the 25th of September. This entry was posted in News, Tbilisi 2017 and tagged #calls on September 16, 2017 by Gega Darakhvelidze. The text you already noticed on the picture is neither a hallucination nor a delusion, that you thought your mind made up. The chance you thought you missed forever, showed up once again. 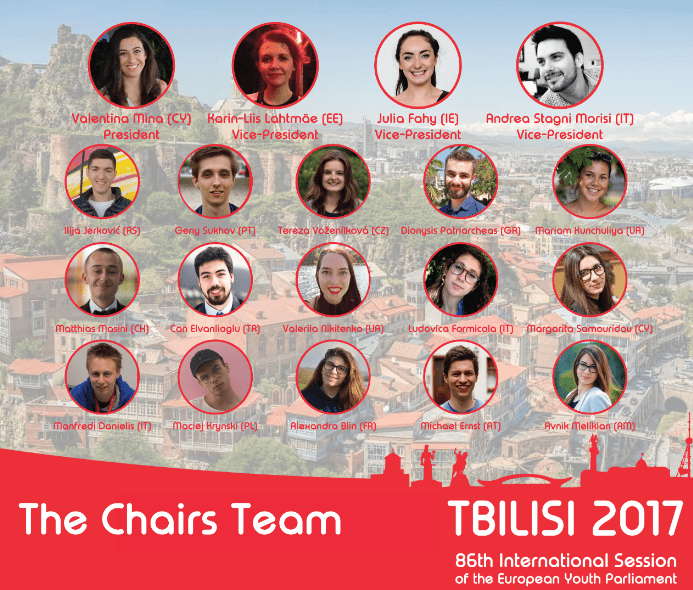 So this time, make a right choice, grab the opportunity of joining the Organisers’ team of Tbilsi 2017! We launch the very LAST call for the organisers. So, if you are a determined, motivated, and enthusiastic EYPer, let us hear from you! Join our Head-Organisers, Tamta and Zurab, to assemble such a flagship event. The organising team, which has been working on 86th International Session of EYP for more than a year now, is happy to meet new members of the officials team. Log in to your account and apply till 18th of September and, remember, this is your last chance! Life often leaves us astonished, they say, and when it gives you an organisers’ call, fill it in! Receive this surprise call as a gift and build up your next few months with hustling spirit of Tbilisi 2017!